SPOILERS for Star Trek: Discovery Episode 202, "New Eden," follow. 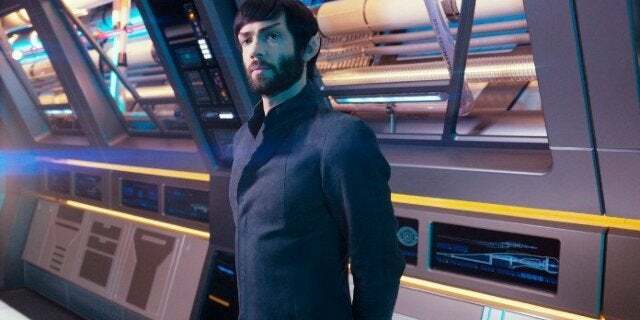 Fans know that Spock, played by Ethan Peck, is coming to Star Trek: Discovery in Season Two. However, despite the title "Brother," Cmdr. Michael Burnham foster sibling did not appear in the show's season two premiere (which can now be watched for free on YouTube). The second episode of the new season, "New Eden," sheds some light on the situation. Burnham later asks to beam aboard the Enterprise to speak with Spock. Pike tells here that it's not possible because Spock isn't aboard the Enterprise having taken leave weeks ago. Pike tells Burnham that he does know where Spock goes, but grants Burnham permission to go to the Enterprise and investigate Spock's quarters. There, Burnham finds Spock's final log aboard the Enterprise . Encoded within is a map of the red signals that Spock created weeks before the bursts actually appeared. In "New Eden," Burnham brings this information to Pike. Learning that spocks can be connected to the red signals prompts Pike to reveal that he does actually know where spock is. Spock committed to the psychiatric ward at Starbase 5. decides that the urgency of Discovery current mission supersedes Spock's desire for privacy. Star Trek: Discovery has revealed that Spock struggled with nightmares as a child and that nightmares recently returned to him. Struggling to understand those nightmares and regain control over his fear may drove Spock to commit himself, but it seems like the fate of the galaxy may now rest on his shoulders. What do you think of Spock committing himself to Starbase 5's psychiatric ward? New Star Trek: Discovery episodes become available ot stream Thursdays at 8:30 pm One on CBS All Access.